allows us to experience a deeper appreciation of what it is we're seeing. The Hand in Silver Spring, MD. is no exception. Ray Kaskey created The Hand to reflect the mission of the National Oceanic and Atmospheric Administration to record and protect the environment. The seagulls are part of the NOAA's logo, and the hand is releasing them gently into the atmosphere. This work of art stands 12 ft. high and is made of Bronze. That is a great work of art. I love the birds coming out. Wow, thats pretty cool Where is this? National Oceanic and Atmospheric Administration in Silver Spring, MD. I always find sculptures like this fascinating. I like learning the meaning behind them too! A beautiful piece, and a timely reminder! Sending you hugs. The birds look so realistic in mid flight! Great symbolic work of art! I've never seen a statue quite like this. Very interesting. That is an amazing statue. I love coming across random amazing things like this! Wow, what a gorgeous statue. I love it! This is so beautiful and unique!!! I could probably stand and look at that for hours. The sculpture is magnificent--the reason given for why the artist made it-priceless! That is one gigantic hand! So cool! I love big sculptures! A lovely meaning to this scuplture! Protect and give freedom is how I view this one. Thanks for sharing. The hand giving back, makes sense indeed. That must have took a lot of work too. Finding good looking sculptures is such a treasure. I would have enjoyed photographing this. It's cool! I like the birds in it. We have something similar at a hospital we'll drive by every now and then. Awesome and the message is even better. That is so cool! I'm always fascinated by big sculptures like this. They're such a testament to mankind's creativity. I really love that. The message makes it so much better too. That is a really neat statue. Though I bet my kids would try to climb it to try to sit in the palm. I have never visited Silver Springs, MD but if I get out there I will have to take a photo by this statue! I love to do that when I travel! Happy Wordless Wednesday! You got all deep with it, and mine is cheeky, LOL!!! What an awesome work of art! I love the meaning behind it. Wow, now that is gorgeous. I love it. Thanks for sharing. How beautiful is this piece of art work. That's an impressive piece of art! Really neat work of art! It is really true that knowing and understanding the artist intent makes a big difference in how appreciate a piece of art. This is a very nice piece, thank you for the extra info which makes it even more interesting and impressing. Beautiful. I am in awe of this sculpture. So beautiful in so many ways. What a beautiful message behind the statue. I would love to see it in person. I liked that - big hand means big help - right? What a really cool statue! Such a neat statue! I love the symbolism. Wow! What an incredible piece. I could literally stare at that for hours. What a gorgeous piece of artwork. I bet the picture doesn't do it justice. What a gorgeous sculpture! To me, it feels like artist freedom is flying from his fingertips! What a great sculpture. It's huge! 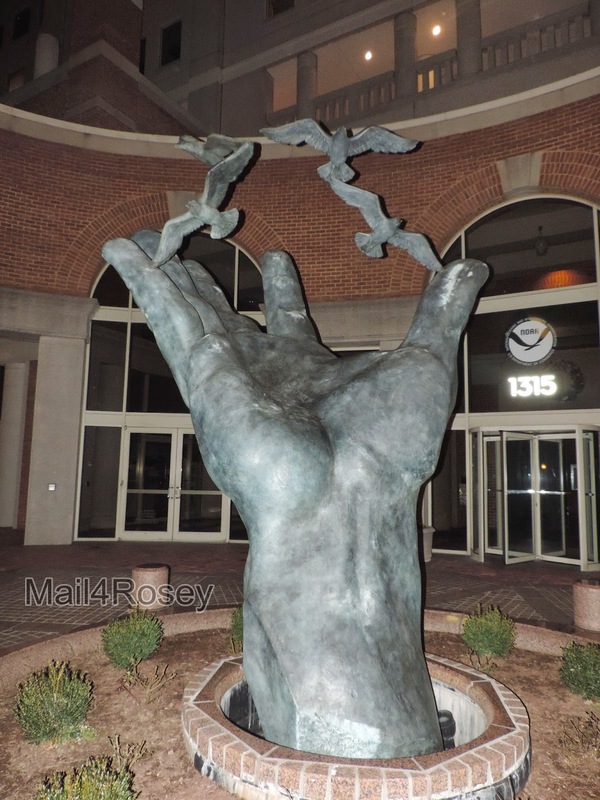 That's an awesome sculpture and I love the "lending a hand" title of the post! I love finding nice statues like this!! That looks huge and would be amazing to see in person. That is so beautiful. I'm loving the pictures of statues that you highlight on your blog. Just love them! I love this piece, it reminds me of a benevolent hand extended in a peaceful greeting. That's a beautiful sculpture! I love pieces like this! Very neat. I love the birds. This is a beautiful sculpture! I love how the seagulls seem like they are truly taking flight! This is so cool! Wish we could visit it..maybe some day. Showed our soon to be 8 & 9 yr old boys and they wanna build one...out of snow. Lol I love it though! I bet this hand cost a lot to put in. Bronze isn't cheap. that is awesome! I would love to see that in person. beautiful! Thats really awesome! THanks for sharing! The hands giving away...an expression of freedom, liberation!! That's really different and freeing! That is one huge sculpted hand. I like how it is gently releasing the seagulls. Although... seagulls aren't my favorite. It seems every time they are around, I get pooped on. Wonder if they are trying to tell me something. That's a beautiful statue-- I love it! So strong! This says a lot! Definitely wordless! What a beautiful work of art that is! OK....I had to Pin this right off the bat. This is an amazing piece - I love its execution, detail, and just the overall concept. It's beautiful. I've heard "a picture (can) paint a thousand words", but, it seems, so can a sculpture. This is absolutely beautiful. This is a really cool sculpture! I love how they were able to incorporate so much symbolism into it and convey such a powerful message. that looks pretty interesting and unique sculpture. Beautiful, It such a peaceful piece! I love this piece. It is so beautiful. It stirs up many different emotions. I think that is a beautiful piece of work. Thanks for sharing it! That is a beautiful peice of art! Thanks for sharing. Have a terrific weekend! That is a beautiful sculpture. I wish i could see it in person to take the effect in. I posted my first Wordless Wednesday last week and I really like it. its a quick and easy way to post on your blog. What a wonderful walk down memory lane for me. I remember visiting some cousins in the DC area years ago and they showed me around and this was one of the sculptures I remembered so vividly. Still love. I can't say that I understand all art or am even hugely interested in it but I do find this particular piece to be interesting and I like the concept behind it. Very cool statue. I love seeing interesting pieces of art like this.